The new Snowdon Six Express chairlift is open. 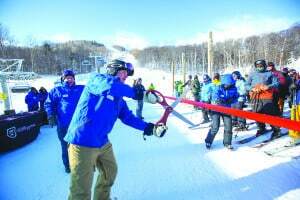 Killington President and CEO Mike Solimano cut the ribbon and the new lifts started spinning at 10 a.m. Saturday, Dec. 8. The new high-speed lift seats six people. It’s manufactured by Leitner-Poma and features a bubble shield that will protect skiers and riders from wind and weather as they ascend 1,100 vertical feet to the Snowdon Mountain peak, which features primarily intermediate cruising terrain. The new lift is part of Killington’s $25 million capital improvement project – the largest single year investment in the resort in more than 20 years. The Bear Mountain Base Lodge also opened this past Saturday with all amenities, including service from the Skye Peak Express Quad. Pico Mountain is scheduled to open Friday, Dec. 14. Wednesday, Dec. 12, marked Killington’s 55th day open this season. Killington President and CEO Mike Solimano cut the ribbon for the new Snowdon high speed chairlift on Thursday, Dec. 8. The bubble lift is open for the season.